A skin tag under the armpit (axilla) is a harmless benign tumor. The bad news is that it/they can become irritated, resulting in pain, soreness, swelling, and bleeding. They don’t look nice, so it’s no surprise that you want to get them removed fast. You can tell if you have an armpit skin tag (or an acrochordon). They’re soft and loose flaps of skin that are attached by a thin stalk, known as a ‘peduncle.’ They aren’t warts, which are flatter, harder, and have a more cauliflower-like appearance. The two conditions are often confused. Touching skin tags under the arm should be avoided because it can lead to irritation or infection. If you can’t stop twisting and touching them, getting skin tags treated at home is highly recommended. Unfortunately, acrochordons rarely go away on their own. 1.1 Why Am I Getting Skin Tags Under Armpits? 1.6 Should I Worry While Shaving My Underarms? What’s a good way to remove a skin tag from the armpit? One of the best methods is the TagBand, which works well for skin tags that are medium or large. 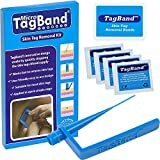 The Micro TagBand is a clever kit that can get rid of skin tags in about 7 to 10 days. It’s a modern version of ligation, and it’s delivering great results without the risk of scarring. 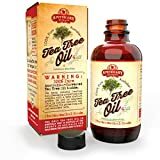 If you have tiny skin tags that are hard to see, we recommend that you apply Apothecary tea tree oil three times per day until they go away completely. It’s an essential oil, so it doesn’t work as quickly as the TagBand, but it’s the safest and easiest-to-use removal method that we’ve found, particularly for clusters. Why Am I Getting Skin Tags Under Armpits? Up to 60% of us will get at least one skin tag during our lifetime. You’re more likely to suffer from skin tags if you’re overweight, 60+ years of age, currently pregnant, and there’s a history of skin tags in your family. They can sometimes be a pre-diabetes symptom. Important: They’re a benign tumor, so they’re rarely a sign of cancer in adults. The only risk is a misdiagnosis. If you notice jagged edges or the color looks a bit off, we advise you to get them expertly checked by a dermatologist. Don’t become too alarmed if your skin tag turned black overnight. This tends to happen when they become twisted. In short, the twisting process has somehow managed to cut off the supply of oxygenated blood. Don’t forget that a skin tag under the armpit is a living part of your body. If it doesn’t receive oxygen, it’ll die and fall off (eventually). If that doesn’t happen, use an over-the-counter skin tag removal product. Ligation, known as tying off skin tags, is a popular treatment. It cuts off the supply of blood to the skin tag with a thin piece of cotton. The skin tag will be starved of oxygen, so it’s unable to survive. While this ‘free treatment’ works well, it also leaves the body susceptible to infection. Why not get a doctor to tie off a skin tag at his/her surgery? While you could ask a dermatologist to perform this procedure, a doctor’s time is expensive. You could end up paying a dermatologist hundreds of dollars for an initial consultation and removal. Health insurance policies don’t cover cosmetic medical procedures, so the cost would need to be met from your pocket. If you do have an infection, please wait for it to clear up completely before you tie off a skin tag or use any form of treatment. If you have a cluster of skin tags, use Australian tea tree oil. You don’t need to spend months treating multiple skin tags. Individual treatment is likely to be too slow, expensive, and time-consuming. Perhaps you want an all-natural option? If you have skin tags and want a 100% natural solution, consider applying tea tree oil. Just apply the formula to the affected area(s), and it will dry it/them up. It isn’t as quick as the TagBand product, which works in about a week, but most people will see results in about 3 to 6 weeks. There’s no risk of scarring. Make sure that you apply it to the skin tag three times a day (morning, afternoon, and night). This method has proven to be effective, as evidenced by the feedback it has received. An advantage of natural tea tree oil is the value for money. You’ll receive a bottle that will last. This is useful because it means that you have a removal method on hand for use in the future, should the need arise. A trichloroacetic acid formula is used to take off a skin tag layer by layer. It does work, and the reviews are encouraging, but be careful during the application process. You’re applying an acid, and it can easily run onto your healthy skin. You may find it difficult to apply this formula to your underarm area, but this can be overcome with the assistance of a third party. If you do decide to use this treatment for removing skin tags, apply the formula to a cotton bud tip or cotton ball so that you can target each skin tag in turn. Cryotherapy – Liquid nitrogen is applied, so skin tags are frozen off. Cauterization – Burn off an acrochordon with an electrical device. Laser treatment – The removal of skin tags with a laser. Creams/gels – The application of skin tags removal cream can be an effective removal method. Essential oils – A natural way of getting rid of armpit skin tags. When you just want to get rid of multiple skin tags, consider using the TagBand device – it’ll remove skin tags fast in around one week. If you do have painful skin tags under the armpits, you’ve probably got an infection. See a doctor as you need to get this problem resolved before using OTC skin tag removal products. Once the discomfort has ceased, you’re free to get started with a treatment plan. A common question that is asked regarding skin tags is if they can turn into cancer. While having one or even several skin tags under the arm can be quite alarming, they are not at all cancerous as we have already stated above and are generally harmless skin growths that plague most people at least once in their lifetime. Skin tags also do not increase the risk of getting any type of cancer either. Should I Worry While Shaving My Underarms? Our armpits are one part of our body that we can find the most friction in, and it also happens to be one of our sweatiest areas as well. All of these factors combine to agitate and irritate the skin under our arms. The sweat can cause chafing, which in turn, can cause unsightly and annoying underarm skin tags to appear. The skin found under our arms is very thin and the apocrine glands (sweat glands) that we develop during puberty become highly concentrated in this area and when the sweat is produced, bacteria tag along as well. One of the biggest worries many people face when plagued with skin tags under the arms is what happens when they shave. You definitely run the risk of cutting the skin tag off while shaving which can then begin to bleed and might even get infected if not properly cared for. To avoid this, it is always best to remove skin tags. If not, the skin under the arms where the skin tags are located can become very irritated, and they can get twisted and pulled which can cause bleeding and infection. When you go to the dermatologist’s office to have your skin tags removed, you will find some hefty price tags. A good majority of the costs involved with removal will be facility costs. The average cost of a skin tag removal is around $200, but this number can vary greatly depending on the office, location, and your health insurance. Typically, health insurance will not help cover the cost of skin tag removal because it is considered a cosmetic need, rather than a medical necessity. The costs may also vary depending on your overall health condition and what happens during the procedure. Are skin tag removals covered at all- even a portion thereof? If so, do I need preauthorization before I can make the appointment? What kind of documentation will my doctor or dermatologist need to provide to ensure that the skin tag removal costs are covered? If you still have questions about skin tag removal or the costs associated with the procedure, you should contact your doctor and insurance company. You should also keep in mind that there are over the counter treatments you can use if you are comfortable removing the skin tags at home yourself.